1) This article is a peer reviewed article presented at the FIG Congress 2014 in Kuala Lumpur, Malaysia. The topic covers the Asian-Pacific area but is relevant and important internationally as well. The Quasi-Zenith Satellite System (QZSS) is a satellite-based augmentation system for the GPS, GLONASS and Galileo constellations, transmitting navigation signals that are compatible and interoperable with the Global Navigation Satellite Systems (GNSS). The enhanced capacity allows augmentation messages aimed at centimeter-level Precise Point Positioning (PPP) to be broadcasted over the QZSS wide area of coverage. The Quasi-Zenith Satellite System (QZSS) is a Japanese regional satellite navigation system consisting of several QZSS satellites in highly inclined elliptical orbits that allows it to cover a wide area in East Asia and Oceania. QZSS is a satellite-based augmentation system for the GPS, GLONASS and Galileo constellations, transmitting navigation signals that are compatible and interoperable with these Global Navigation Satellite Systems (GNSS). In addition to the navigation signals, QZSS also transmits augmentation signals L1-SAIF and L-band Experimental (LEX) Signal. The LEX signal is unique for QZSS in that it is capable of delivering 2kbps (1695bps of effective bit rate) of correction messages compared to the 250bps of legacy Satellite based Augmentation Systems (SBAS) like the MTSAT Satellite-based Augmentation System (MSAS). This enhanced capacity allows augmentation messages aimed at centimeter-level Precise Point Positioning (PPP) to be broadcasted over the QZSS wide area of coverage. One such message is the Multi-GNSS Advanced Demonstration of Orbit and Clock Analysis (MADOCA) based messages which are currently being broadcasted by the LEX signal. The aim of this research was to evaluate the quality of the corrections include the MADOCA messages and the performance of real-time PPP using these augmentation messages. Centimeter-lever position accuracy was obtained for static PPP after 2 hours of coonvergence and decimeter-level accuracy was obtained for kinematic PPP after 1.5 hours of coonvergence. This service is expected to become continuously available for most of East Asia and Oceania region in 2018, when the QZSS constellation gets enhanced to four satellites. GNSS Precise Point Positioning (PPP) has been an active research topic as it is capable of delivering high accuracy (centimeter to decimeter-level) point positioning solutions using a single GNSS receiver, thereby eliminating the constraints of baseline length and simultaneous observation at both rover and reference stations. This mode of positioning technique is feasible in remote areas and regions of low GNSS reference stations. One of the caveats of PPP is the availability of precise satellite orbits and clock corrections. These corrections need to be transmitted to users and is critical for real-time applications. At present, these corrections enabling PPP are available for free on the Internet. From a practical viewpoint, the Internet and/or terrestrial broadcasting is not a viable solution as it inherits telecommunication issues of such as; connection issues, roaming charges, latency, standards and transmission on different radio frequencies. Satellite broadcasting, on the other hand, is a more preferred method. But this mode of communication link is only available currently to users who are willing to pay. The Quasi-Zenith Satellite System (QZSS) is a Japanese regional satellite navigation system developed by the Japan Aerospace Exploration Agency (JAXA). The aim of QZSS is to enhance the current availability and performance of GNSS typically over Japan and region centered in the 135º E meridian. Besides transmitting conventional positioning signals, QZSS also transmits augmentation signals to enhance the performance of GNSS (Sawamura et. al., 2012). One of the QZSS augmentation signals, i.e., the L-band experimental (LEX) signal, is designed to enable high accuracy positioning in real-time and time transfers through transmission of precise corrections. RTK like performance (3 cm horizontal and 6 cm vertical RMS errors with time to first fix of 35 seconds) has already been reported for tests in Japan (Saito et. al. 2011).These messages are only valid in Japan and rely on regional corrections that include ionospheric and tropospheric corrections. Another type of correction messages with global validity are currently being tested for high accuracy positioning. These messages are called MADOCA-LEX messages. They currently include orbit and satellite clock corrections, estimated User Range Accuracy (URA) and code biases for GPS and QZSS satellites, allowing standard PPP to be performed within the QZSS coverage area. A recent agreement between the Cooperative Research Centre for Spatial Information (CRCSI) and JAXA has made the LEX signal and correction messages available for experimentation in Australia. Research is currently ongoing with the aim to assess the capacity of the QZSS-LEX signal to deliver a high accuracy real-time PPP service to the Australian GNSS users. This paper evaluates the current MADOCA messages both in terms of the quality of its orbit and clock corrections and the quality of real-time PPP position estimates using these MADOCA-LEX corrections. This paper is structured in five sections. First, a brief description of the Japanese QZSS system and the LEX signal is given in Section 2. The structure of the MADOCA-LEX messages and the quality of its orbit and clock corrections are described in Section 3. The experiment settings and results of real-time PPP using MADOCA-LEX messages are presented in Section 4; and finally, a summary of findings and plans for future research are outline in Section 5. QZSS is a Japanese regional satellite navigation system (when fully deployed) consisting of several QZSS satellites placed in Highly Inclined Elliptical Orbits (HEO) and Geocentric Orbits (GEO). The system is designed so that at least one satellite is constantly located at a high angle of elevation over Japan, thus the term ‘quasi-zenith’. Other neighboring countries centered in the 135º E meridian are also able to benefit from this regional navigation satellite system. JAXA successfully launched the first QZSS satellite, ‘Michibiki’ (or QZS-1), on 11 September 2010. JAXA declared QZS-1 user-ready in June 2011. Three more satellites are commissioned to be launched by 2018 (Clark, 2013), bringing the constellation to three HEO satellites and one GEO satellite. QZSS is intended as a regional augmentation system for GNSS, aimed at enhancing the availability and the performance of GNSS based Positioning Navigation and Timing (PNT). QZSS is a satellite-based augmentation system (SBAS) for both GPS, GLONASS and Galileo. It is capable capable of transmitting navigation signals, i.e., L1CA, L2C, L5, L1C, that are compatible and interoperable with these GNSS. In addition to the navigation signals, QZSS also transmits two augmentation signals, i.e. L1-SAIF (Sub-meter class Augmentation with Integrity Function) and LEX. The L1-SAIF signal is compatible with the SBAS system, which provides sub-meter accuracy wide-area differential corrections as well as integrity for safety of life services such as those utilized in the aviation industry. The LEX signal, on the other hand, is specifically designed to enable high accuracy real-time PPP and time transfers. In order to cover the East-Asia and Oceania region, the QZSS will make use of HEO and GEO satellites. The first satellite, QZS-1 intended to be used for system evaluation was launched in a HEO orbit. The orbit parameters and ground track the of QZS-1 satellite are presented in Table 1. The proposed two HEO satellites to be launched by 2018 are expected to have the same ground track with eight hours of offset, i.e. the same semi-major axis, eccentricity, inclination and perigee with ±120° offset in right ascension angle. All QZSS satellites have a mean anomaly of 135° E central longitude. This orbit has good coverage over East-Asia and Oceania region, with a high elevation at around 135° E meridian and between 40° S and 40° N latitude. Table 1. QZS-1 HEO parameters. The QZSS-LEX signal is an experimental performance enhancement signal transmitted on 1278.5 MHz carrier, which has the same frequency as the Galileo E6b signal. Numerous organizations, e.g., JAXA, Spatial Positioning Research and Application Centre (SPAC), National Institute of Information and Communications Technology (NICT), and Geospatial Information Authority of Japan (GSI), are currently investigating and evaluating the signal to support their own PNT applications (Kanzaki & Noguchi, 2011). Figure 1 illustrates the navigation message modulation for the LEX signal. Figure 1. LEX signal code modulation (JAXA, 2013). The LEX signal uses a Kasami series short code (2.5575 Mcps) with a chip length of 10230 and a 4 ms period, and a Kasami series long code (2.5575 Mcps) with a chip length of 1048575 and a 410 ms period. The short code is modulated by the navigation message using a 256-ary Code Shift Keying (CSK), which consists in replacing the short code with a left circle shifted version of it, the number of steps to be shifted representing the symbol value (JAXA, 2013). The LEX navigation message is grouped in frames of 250 symbols which are transmitted every second. 8 bits indicating the satellite transmitting the message (193 for the QZS-1 and 194 to 196 for the next three QZSS satellites), 8 bits indicating the type of message and an alert flag of 1 bit are added to 1695 bits of data to form 214 symbols of 8 bits each. The 214 symbols are encoded into 246 symbols using a shortened Reed-Solomon code. Finally four preamble symbols i.e. “1A, CF, FC, 1D” are added. Most the factors governing the availability of the LEX receiver can be considered either independent of the receiver geographical location or to be highly correlated with the elevation of the satellite. The probability of successfully decoding the CSK modulated LEX message, as a function of the QZS-1 satellite elevation is shown in Figure 2. The results were obtained from correspond to three days of observations performed in Melbourne between March 8 and March 10 of 2013 (Choy et al. 2013). As shown in Figure 2, the LEX signal availability can be expected to be over 90% when the QZS-1 satellite is above 40º of elevation. Figure 2. LEX message availability as a function of QZS-1 satellite elevation. The left pot in Figure 3 shows the number of hours a day the QZS-1 satellite can be seen at more than 40º of elevation over the East-Asia and Oceania region. The right plot in Figure 3 show the estimated number of hours a day, at least one QZSS satellite will be over 40º of elevation. The LEX signal can be expected to be available 24-hours a day for most of the East-Asia and Oceania region by 2018 with three active HEO satellites. Figure 3. Current LEX message availability with one QZSS satellite (left). Expected LEX message availability with 3 active HEO satellites in 2018 (right). As of April 2013, the LEX signal started to transmit precise orbits and clock corrections generated from the MADOCA (Multi-GNSS Advanced Demonstration tool for Orbit and Clock Analysis) software developed by JAXA. The corrections included in these MADOCA-LEX messages have global validity and thus can be used over the whole coverage region. 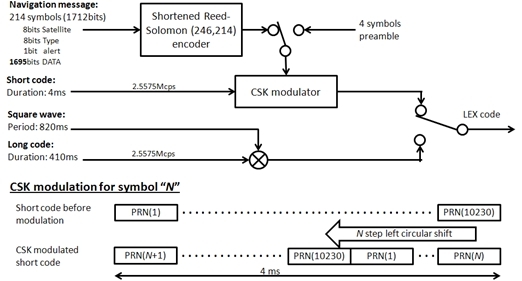 The MADOCA-LEX messages are coded within the 1695 bits of data following a format derived from the RTCM 3.2 standard as illustrated in Figure 4. Of the 1695 bits allocated for data, 33 bits are used to transmit the time in which the LEX message is transmitted. The contents of the RTCM 3.2 frame, with the exception of the header and parity check bits, are allocated in the remaining 1662 bits. Figure 4. Data format of a MADOCA-LEX message. Table 2 shows the type of corrections included in the MADOCA messages and their update rates (as of November 2013). Currently the MADOCA messages include orbits corrections, clock corrections, User Range Accuracy (URA) and code bias for GPS satellites and orbit corrections, clock corrections and URA for the QZS-1 satellite. Planned future developments are the inclusion of GLONASS messages to allow multi-GNSS PPP and phase bias messages messages to allow PPP Ambiguity Resolution (PPP-AR). Also a series of correction messages generated in Australia are in development as a part of a research project based on an agreement between CRCSI and JAXA, these messages are also expected to follow the MADOCA-LEX structure. The quality of the precise orbits and clock corrections included in the augmentation messages has a direct impact in the achievable accuracy and convergence time of the PPP solutions. In this section we present the quality of the orbit and clock corrections included in the MADOCA-LEX messages. The orbit and clocks evaluated in this section were calculated from MADOCA-LEX messages collected in Melbourne between September 18 and September 20, 2013. Table 3 shows the difference between the precise orbits and clock corrections obtained using the MADOCA-LEX products and those obtained from the IGS final products. These errors on radial, along and cross track components of the GPS satellite orbits are shown in meters while the clock correction errors are shown on nanoseconds. Errors of the orbit and clock errors obtained from the IGS real-time stream from the caster products.igs-ip.net (mountpoint CLK11). These products are hereafter called IGS-RT and were collected alongside the MADOCA-LEX products as a comparison. The orbit errors of the MADOCA-LEX products were about as twice as large as those obtained from the IGS-RT stream for the measured period. However, the contribution of the orbit errors in the Signal–in-Space Range Error (SISRE) was less than 0.050 m (0.043 m for MADOCA-LEX, 0.019 m for IGS-RT). This made the clock error, equivalent to 0.229 m for MADOCA-LEX and 0.212 m for IGS-RT, the dominant factor in determining the SISRE. As a consequence, the SISRE can be expected to differ in less than 10%. For the case of the RJAP station, described in Section 4.1, the measured SISRE was 0.226 m for MADOCA-LEX and 0.216 m for IGS-RT. The MADOCA-LEX products were evaluated for real-time PPP in different conditions. In the present paper we present two fixed point tests and a vehicle test. The fixed point tests consist on a static-PPP test performed on August 1, 2013 and a kinematic-PPP test performed between September 18 and September 20, 2013. The vehicle test was performed on October 23, 2013. All positioning solutions were generated using RTKLIB software (Takasu & Yasuda, 2009), and were GPS-only solutions. The observables for the test were obtained using a surveying grade GNSS receiver and the MADOCA-LEX corrections were obtained using an independent receiver. IGS-RT products, used as a benchmark for the MADOCA-LEX test were streamed using mobile broadband router connected to a cellular network. The fixed point tests described in this section were performed GNSS reference station (station ID: RJAP) near Melbourne, Australia. The ITRF08 coordinates of RJAP station, obtained from the NRCAN PPP service are presented in Table 4. The GNSS receiver, i.e. a Javad DELTA-G3T was connected to the Javad GrAnt-G3T antenna shown in Figure 6. Table 4. ITRF08 coordinates of RJAP station on 27 February 2013. The LEX antenna, i.e. a G5Ant-2A4MNS1 from ANTCOM (ANTCOM 2010), was also mounted on another of the pillars, as depicted in Figure 6. The LEX messages were demodulated and decoded by a software receiver named LEX Message Streamer from Lighthouse Technology and Consulting Co. Ltd. Figure 6. RJAP station at RMIT Bundoora campus. 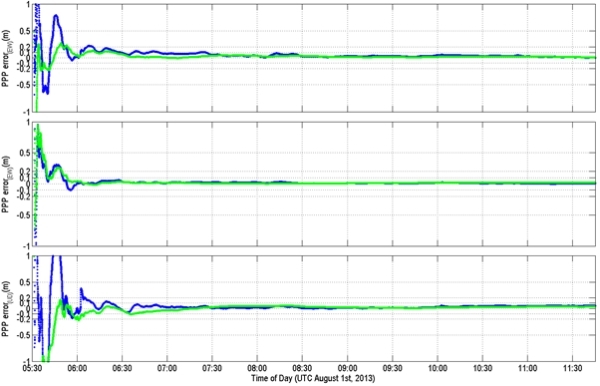 The static test presented in this section was performed from 05:30 UTC to 23:30 UTC on August 1, 2013. The mean, standard deviation (STD) and RMS error of the static PPP using MADOCA-LEX corrections are presented in Table 5. The position errors were computed with respect to the ‘known’ coordinates of RJAP. Static PPP results using IGS-RT products are also presented for comparison. The results in Table 5 are calculated without taking into account the first 2 hours to give time for the PPP solution to converge. The 3-dimensional RMS error for PPP using MADOCA-LEX solutions was 0.041m, which is about 25% larger than the case where IGS-RT products were used. The time series for the first 12 hours of the static tests is shown in Figure 7, MADOCA-LEX solutions are shown in blue, IGS-RT solutions are shown in green. Two hours is an appropriate convergence time for the PPP solutions in the test. Figure 7. Performance of static PPP using MADOCA-LEX products (Blue) and IGS-RT products CLK11 (Green). RMS errors were E/N/U: 0.029m/0.012m/ 0.026m for MADOCA-LEX. The kinematic tests presented in this section were performed from September 17 to September 22, 2013. A total of 8 tests ranging from 3 to 9 hours were performed. The mean, STD and RMS error of the kinematic PPP using MADOCA-LEX corrections are presented in Table 6. Equivalent statistics for kinematic PPP using IGS-RT products are also presented for comparison. A total of 11 tests ranging from 3 to 9 hours were performed. The values presented in Table 6 were calculated after discarding the first 2 hours of data for each test as time for convergence. The 3-dimensional RMS error for PPP using MADOCA-LEX solutions was 0.145m, which is about 18% larger than the case where IGS-RT products were used. 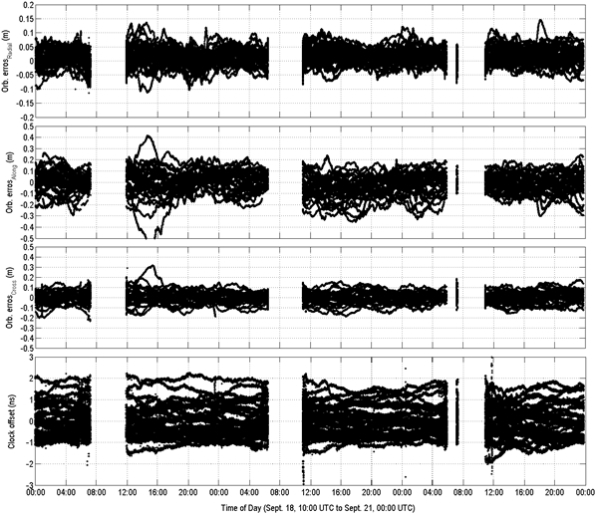 Figure 8 shows the time series for the first 6 hour the kinematic PPP tests. Figure 8. Performance of kinematic PPP using MADOCA-LEX products. 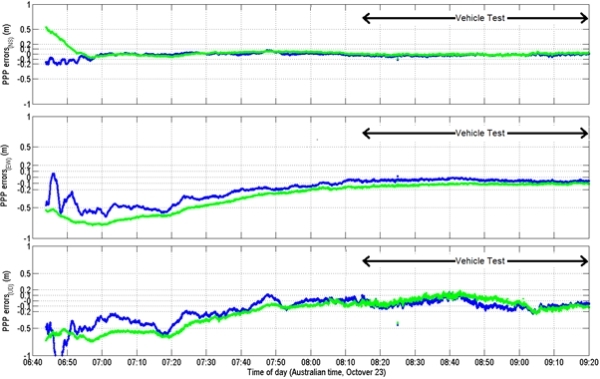 As is shown in Figure 8 the convergence time seemed to be over 2 hours for some cases. Table 7 presents the RMS errors at different convergence times. The values in the tables were calculated using measurements corresponding to a 10 minutes period just after the convergence time. The 3-dimensional RMS errors 120 to 130 minutes after the start of each test are 0.200m, 38% higher than the RMS errors calculated from 120 minutes to the end of each test. For comparison, the RMS error values for different convergence times are shown in Table 8. Here also can be seen that 120 minutes are not enough to full convergence, the 3-dimensional RMS errors being 26% higher than the final value. It can also be seen from Tables 7 and 8 that the convergence time decreases after 90 minutes, with less than 10% difference in 3-dimensional RMS values between 90 and 120 minutes of convergence. The kinematic vehicle test described in this section was performed from 21:15 UTC to 22:20 UTC on October 23, 2013 in Centennial Park, Sydney, Australia (approximate coordinates 33°53’S, 151°13’E). The GNSS and LEX antennas were mounted on the roof of a car connected to receivers placed inside the car. As a reference for this vehicle test, network RTK positions were obtained using a Leica GX1200 receiver connected to the CORSnet network (ie. RTK solutions). The GNSS receiver used in this test, a Novatel OEM-04, was connected through a splitter to the Leica receiver’s antenna. Figure 9 shows the ground track and measurement conditions for the vehicle experiment. A period of convergence of approximately180 minutes was taken before starting the vehicle test. 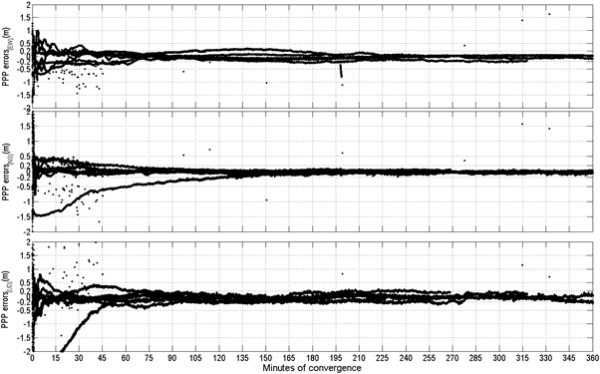 Figure 10 shows the time series for the positioning errors for the vehicle test and the period of convergence. Figure 9. Ground track of vehicle tests performed on Sydney. The mean, STD and RMS error of kinematic PPP using MADOCA-LEX corrections are presented in Table 9. The position errors were computed with respect to the network RTK solutions obtained from the Leica receiver. Equivalent results for kinematic PPP using IGS-RT products are also presented for comparison. The 3-dimensional RMS error for PPP using MADOCA-LEX solutions was 0.113m, and 0.121m using IGS-RT products. In this case the errors for kinematic PPP using IGS-RT products are higher than those obtained using MADOCA-LEX. Although the exact reason governing this performance difference needs to be studied further, the difference in this case may be due to the terrestrial data networks. In order to illustrate this, a third set of results for real-time PPP are presented in Table 9. The MADOCA-NTRIP products used for this third solution are the same RTCM3.2 messages packaged in the MADOCA-LEX messages. But were transmitted via the terrestrial communication network. The 3-dimentional RMS error of this third solution is 0.155m, about 28% higher than the IGS-RT solutions. The Japanese QZSS system is a GNSS augmentation system that aims to provide enhanced performance of satellite based positioning over East Asia and Oceania. One of the signals transmitted by the first satellite of the system is the LEX signal. The LEX signal is designed to provide enhanced accuracy of GNSS based positioning. The services provided by the LEX signal are expected to cover most of the East Asia and Oceania region by 2018. One of the services being tested in the LEX signal is the transmission of MADOCA-LEX messages, which contain precise orbit and clock corrections that allow real-time PPP over its coverage area. In the present paper the performance of real-time PPP using MADOCA-LEX messages was tested in both fixed point and vehicle tests and compared with real-time PPP using the IGS-RT streams. For the static PPP, a 3-dimentional accuracy of 0.041m can be expected after 2 hours or more of convergence. This accuracy is comparable with those obtained in with IGS-RT messages (0.033m). Also, these accuracies are close to those obtainable from post processed PPP algorithms such as NRCAN’s PPP services (reported to be about 2cm). For kinematic PPP, a 3-dimentional accuracy of 0.200m can be expected after 90 minutes of convergence and 0.145m after a few hours. These decimeter level accuracies were obtained both in fixed point and vehicle tests up to speed of about 10m/s. These results are also similar to those obtained from using IGS-RT products. 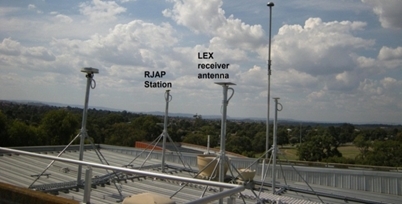 It is to note however that both these tests were performed under open sky conditions, the performance of PPP using MADOCA-LEX products under more urban environments as well as the effects of the latency induced by the terrestrial or satellite communication links used is currently under investigation. Research efforts aiming to further enhance the capabilities of the LEX signal to provide high accuracy positioning is being undertaken by JAXA. Also, research in the usage of the LEX signal for real-time PPP is being performed as part of CRCSI Project 1.11. As part of that effort, a communication link between RMIT and JAXA, intended to transmit correction messages generated in Australia, was tested on November 17 of 2013. This research is funded through the Australian Cooperative Research Centre for Spatial Information (CRCSI Project 1.11) and is a collaborative project between the CRCSI and the Japan Aerospace Exploration Agency (JAXA). The CRCSI research consortium consists of RMIT University, University of New South Wales, Victoria Department of Environment and Primary Industry, New South Wales Land and Property Information and Geoscience Australia. The authors would also like to thank JAXA for providing the GNSS and LEX receivers for testing. The effort of the IGS to provide precise satellite orbits and clocks is gratefully acknowledged. Sawamura T., Takahashi T., Moriguchi T., Ohara K., Noda H., Kogure S., Kishimoto M. (2012): Performance of QZSS (Quasi-Zenith Satellite System) & L-Band Navigation Payload, Proceedings of the 2012 International Technical Meeting of The Institute of Navigation, Newport Beach, CA, January 2012, 1228-1254. Saito M., Sato Y., Miya M., Shima M., Omura Y., Takiguchi J., Asari K. (2011): Centimeter-class Augmentation System Utilizing Quasi-Zenith Satellite, Proceedings of the 24th International Technical Meeting of The Satellite Division of the Institute of Navigation, Portland, OR, September 2011, pp. 1243-1253. Clark S. (2013): Japan to build fleet of navigation satellites. Spaceflight Now. http://www.spaceflightnow.com/news/n1304/04qzss/#.UYAeCbUziGH (accessed April 2013). Kanzaki M., Noguchi N. (2011): Experimental Results of LEX Corrections Using Farming Machine, Sixth Meeting of the International Committee on Global Navigation Satellite Systems (ICG), Tokyo, Japan, September 2011. Takasu T. and Yasuda A. (2009): Development of the low-cost RTK-GPS receiver with an open source program package RTKLIB, International Symposium on GPS/GNSS, Jeju, Korea, November 2009. Ken Harima obtained his Bachelor’s degree in Elctronic Engineering from Universidad Simon Bolivar, Caracas Venezuela, in 2002. He obtained PhD degree from the University of Tokyo in 2012.He is currently a research fellow at the School of Mathematical and Geospatial Sciences in RMIT University. He research interest are GNSS receivers and SBAS systems. Yong Li is a senior research fellow at the Satellite Navigation and Positioning (SNAP) Lab within the School of Surveying & Spatial Information Systems, the University of New South Wales (UNSW), Sydney, Australia. His current interests include integration of GPS, INS, and pseudolite (Locata), attitude determination, GPS receiver technique, FPGA technology, and its application to navigation, and optimal estimation/filtering theory and applications. Chris Rizos is a graduate of the School of Surveying, The University of New South Wales(UNSW), Sydney, Australia; obtaining a Bachelor of Surveying in 1975, and a Doctor of Philosophy in 1980 in Satellite Geodesy. He is currently a member of the School of Civil & Environmental Engineering, UNSW. Chris research experitise is high precision applications of GPS. He is a member of a Fellow of the Australian Institute of Navigation, a Fellow of the U.S. Institute of Navigation, a Fellow of the International Association of Geodesy (IAG), an honorary professor of Wuhan University (P.R. China), and is currently President of the IAG (2011-2015). GPO Box 2476V, Melbourne, Victoria 3001, Australia.